England's dreams of a first Grand Slam in a decade live on after they survived a bruising, breathless battle at a freezing Twickenham. A brilliant breakaway try from Wesley Fofana and the boot of Morgan Parra had given France a 10-9 half-time advantage as England struggled for possession and fluency. But a fourth successful penalty from Owen Farrell stole back the lead before an opportunistic try from the indomitable Manu Tuilagi and two late penalties from replacement Toby Flood snuffed out the tiring visitors. England's replacements made a huge impact in the nervous final quarter, the team once again showing a maturity beyond their experience to stay strong as their opponents crumbled. France have now lost their last five matches in this competition for the first time since 1958, a much-improved first-half display undermined by indiscipline. England's victory means they have now won six of the last seven Six Nations clashes against their great cross-Channel rivals. And with a struggling Italy next up at Twickenham in a fortnight's time, there is every chance they will travel to Cardiff on 16 March knowing a win would give them both the championship and Grand Slam. 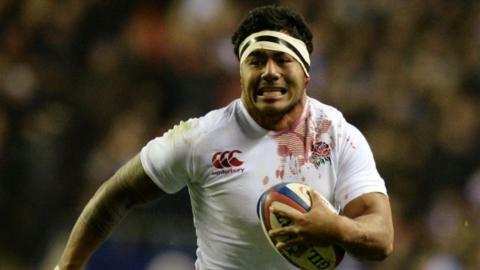 Farrell had given England the lead with barely a minute gone before Parra levelled it with his own first penalty. Initially, the contest struggled for momentum, the scrum messy and both sides guilty of handling errors as the big tackles came in. On a rare foray deep into the French 22, Farrell's inside pass found Tuilagi thundering and stepping, and only a last-gasp tackle from Parra prevented the try. The French forwards had already transgressed, Farrell making it 6-3 on 27 minutes, but a devastating run from the gifted Fofana seized the initiative back for the under-fire visitors. There looked to be little danger when the centre took midfield partner Mathieu Bastareaud's flat pass but he accelerated through poor tackles from Courtney Lawes and Chris Ashton to burst clear down the left wing, hand off Ben Youngs and race under the posts. It was no less than France deserved, their loose forwards impressive and their set-piece more solid than England's. Farrell's third successful penalty narrowed the deficit to a single point at half-time, but it was England with work to do - their tackling too often sub-par, their decision-making sometimes questionable. They were shoved off their own scrum as the second half began, only for the left-footed Parra to pull his penalty to the right of the posts. When they did have possession, Ashton was turned over as he looked to escape down the right, and then a line-out 10 metres from the French try-line was stolen by Christophe Samson. Farrell's boot was the constant. He made it 12-10 when Parra was penalised, and coach Stuart Lancaster looked to capitalise by bringing on James Haskell, Tom Youngs and Mako Vunipola for Lawes, Dylan Hartley and Joe Marler. The scrum immediately tightened, and when a penalty was sent skywards by Farrell the ball was spilled under pressure. It appeared to come off Vunipola in an offside position, but Tuilagi was the first to react, scooping up the loose ball and rumbling away into the open spaces behind the French line to make it 17-10 with 25 minutes left. The capacity crowd celebrated what they hoped might be the pivotal play, only for Farrell to miss a difficult conversion and Joe Launchbury then wander offside to allow replacement fly-half Frederic Michalak to cut the lead to just four points. It was sloppy from England, and Farrell then scuffed a long-range penalty - albeit though he was clearly injured - and was replaced by Toby Flood a moment later. England's replacements were making their presence felt, Danny Care on for Youngs and speeding up the delivery, France throwing the ball around with increasing abandon. Twice, little kick-throughs from Flood almost put his wingers in, the forwards punching holes, Tuilagi dominating the much-anticipated clash with his huge opposite number Bastareaud. The pressure began to tell. Another infringement at the breakdown allowed Flood to stretch the lead to 20-13 with eight minutes left, and when French players again failed to roll away at the breakdown Flood added three more. There was no way back for Les Bleus, and Twickenham could celebrate another fine win for this impressive young squad. England: Goode, Ashton, Tuilagi, Barritt, Brown, Farrell, B Youngs, Marler, Hartley, Cole, Launchbury, Parling, Lawes, Robshaw, Wood. Replacements: Flood for Farrell (62), Care for B Youngs (59), T Youngs for Hartley (52), Vunipola for Parling (52), Haskell for Lawes (52). Not Used: Wilson, Waldrom, Twelvetrees. France: Huget, Clerc, Bastareaud, Fofana, Fall, Trinh-Duc, Parra, Domingo, Kayser, Mas, Samson, Maestri, Nyanga, Dusautoir, Picamoles. Replacements: Michalak for Trinh-Duc (53), Machenaud for Parra (67), Debaty for Domingo (56), Szarzewski for Kayser (56), Ducalcon for Mas (65), Suta for Samson (65), Claasen for Nyanga (69). Ref: Craig Joubert (South Africa).